The one thing that separates a training programme from just an exercise programme. If you want to stay consistent with your workouts and get better results from your efforts, you need something to shoot for. 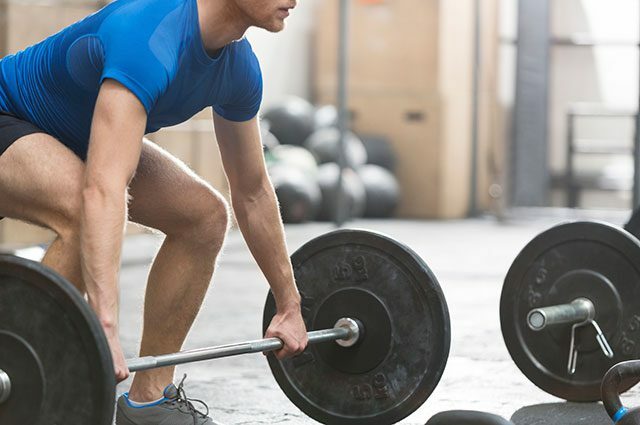 To get the athletic and muscular body you’ve always envisioned (not to mention the performance and fitness levels to go with it), pursuing and achieving the strength benchmarks outlined here will allow you to achieve both. Take a look to see how you measure up and where you can improve. Note: If you’re over 45 or have less than two years of consistent training, aim for 80 percent of all the goals listed. Having a strong core is not only aesthetically pleasing, it’s also essential for lifting heavy weights, performing better and staying injury-free. Perform the standard plank once a week for maximum time. But performing more demanding versions, like ball saws and stir-the-pot planks on a stability ball for shorter periods will develop strength faster and allow you to perform better during the regressed exercise. Set up in a push-up position, but instead of having your weight on your hands, place it on your elbows. You should be in a perfectly straight line. Don’t allow the back to sag. Flexing your glutes and quads will create more stability while performing this exercise. 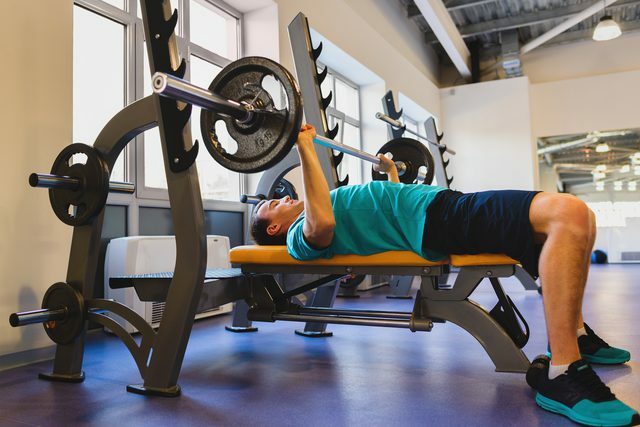 A good goal is to bench press 1.5 times your body weight for one repetition, or 85 percent of that number for five repetitions. Work in the lower rep ranges (one to six) most often. But there is definitely benefit in doing some high-rep work occasionally, particularly if you haven’t been training for very long. Lie on your back, grasp a barbell at shoulder width or slightly wider, lower the bar to the mid-chest and drive the bar back up to full extension. The standing barbell press is a strong indicator of your maximal pressing strength. This move focuses on the front shoulders, triceps and core muscles. A good goal is to press your body weight for one rep, or 85 percent of that number for five reps. The first goal is to include this exercise in your workouts. Next, work the smaller stabiliser muscles (external shoulder rotators, rotator cuff, lats and triceps). This will allow your body to express more strength and help prevent injury. Grasp a bar about shoulder width, starting with the bar on the upper chest. Tense your whole body, and without using your lower back, drive the bar over your head and slightly back. 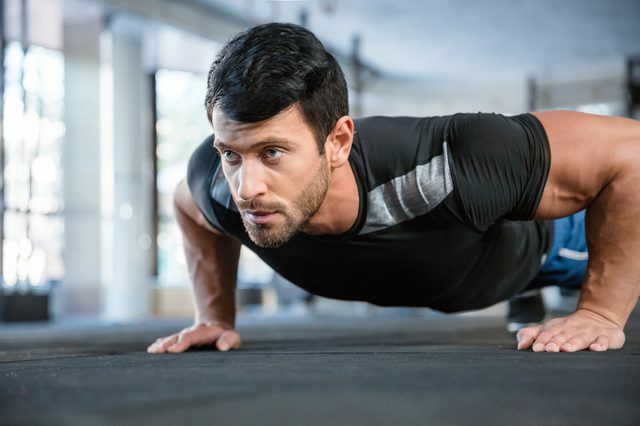 The good, old-fashioned push-up is a fantastic indicator of your upper-body strength endurance, specifically in your chest, front shoulders, triceps and core. A good goal for most guys to shoot for is 50 full-range repetitions. To work yourself up to this, increase your training volume so your chest can adapt. Do push-ups frequently, and test your repetition max weekly. Assume a standard push-up position, with your hands outside your chest. Lower yourself down to the floor, keeping the elbows tucked in about 45 degrees. Drive back through the floor. 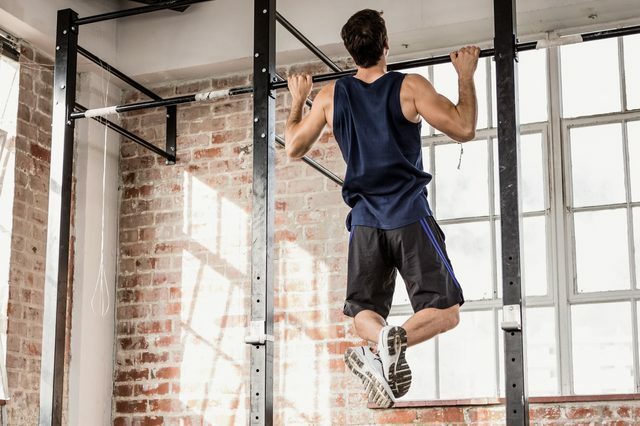 To perform, start from a dead hang from an overhead bar. 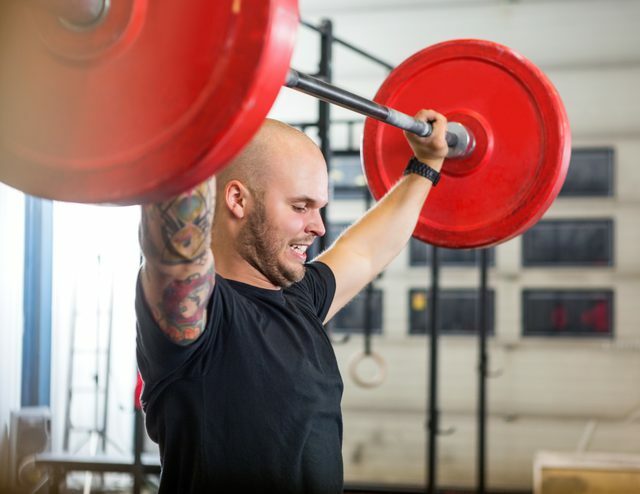 Aggressively drive your elbows down — focusing on pulling your shoulder blades down — and pull yourself up over the bar until it hits your upper chest. Perhaps no other exercise indicates your full-body strength better than the deadlift. 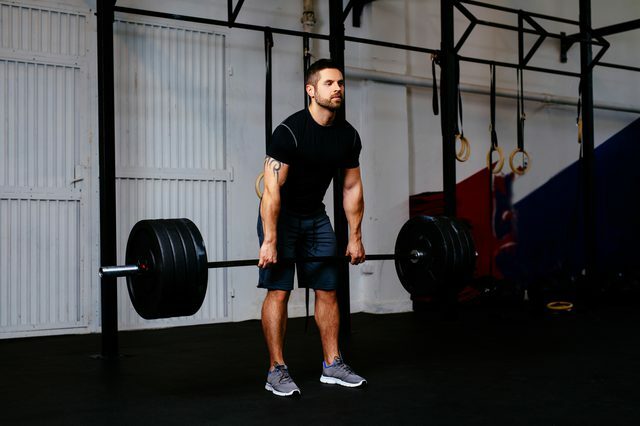 Shoot for pulling 2.5 times your body weight for a single rep or 85 percent of that number for five reps. One of the best ways to improve your deadlift numbers is to do more sub-maximal work in the 70 to 75 percent range and focus on speed and technique. Set a timer for 10 minutes and perform one to two reps every minute, on the minute. Align a loaded barbell with the middle of your feet (feet inside shoulder width). Bend over and grasp the bar. Pull your hips down, flex your lats, brace your core and grip the bar hard. Break the bar from the floor and pull up until standing. The barbell squat has long been heralded by gym rats as the “king of all exercises.” A strong goal is two times body weight for a single rep or 85 percent of that number for five reps. Breathing in while expanding your belly and lower back muscles before you descend in the squat will help you lift huge weights and protect your spine. Place a barbell across your upper back, keeping the shoulder blades pulled together. Un-rack the bar, step back, set your feet slightly wider than shoulder, and then push the hips back and descend to point just below parallel. To finish the rep, stand up aggressively to full extension. 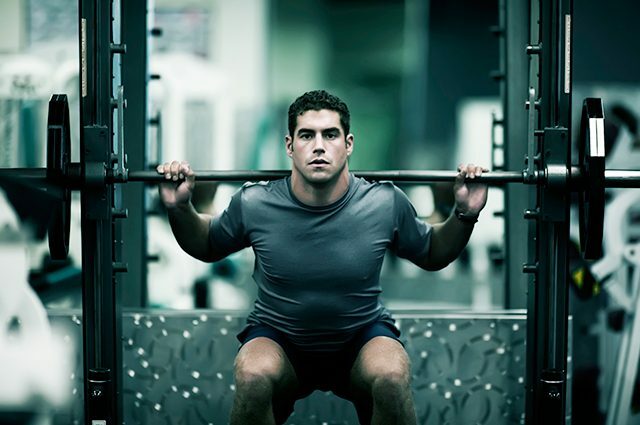 The hip thrust has quickly become a staple in the programs of serious strength trainees. It’s a fantastic indicator of your posterior chain muscle strength: the glutes, hamstrings and lower back. Shoot for 10 reps with 1.5 times your body weight. Do pyramid your sets, performing a set of 10, 8, 6, and then a set of 15. Pause for one second between each rep. Roll a loaded barbell over your legs so it’s sitting across the front of your hips. With the knees bent and your back elevated on a standard bench, hold the bar just outside the hips and then thrust up until you are parallel to the floor. While strength — the ability to produce force — is important, power (how quickly you can express your strength) is equally important. A good goal is to hang clean 1.25 times your body weight for one rep or 85 percent of that number for five reps. To achieve this goal, once you have the technique, use the hang clean one to two times per week at the beginning of your workouts. 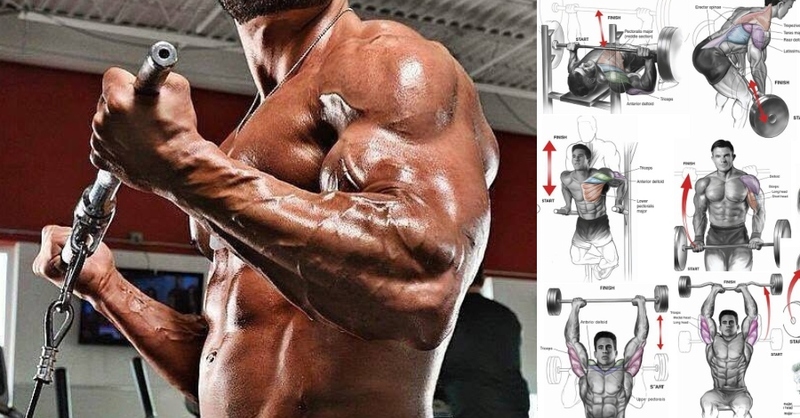 Be careful not to do more than four to five reps per set so that your technique does not begin to falter. Grasp a barbell at arm’s length and shoulder-width apart. Push the hips back until the bar barely clears the knees. Explode and extend at the hip, knee and ankle, shrugging and pulling the weight up towards the chin. Allow your elbows to rotate underneath of the bar and catch it in a racked position. What do you think about these strength benchmarks? Too tough? Too easy? Which ones can you do already? Which ones are you still working toward? What are your fitness goals and how are you planning to achieve them?